Last week during the European Robotics Forum we were awarded with two prizes in two different leagues. First we won the “Best Team” Award in the Customer Service Robotics league. We have a long tradition in this league tracing back to the RoCKIn competitions. For the first time, we tried to compete in the European Robotics League for Professional Service Robots and succeeded. The Customer Service Robotics league focusses on benchmarking robots in domestic scenarios where the Professional Service Robotics league focusses on more industrial settings. This year the difficulty for Customer Robotics was slightly increased i.e. in the Getting to Know my Home task, the robots should autonomously create a semantic map of the environment and in the end should be able to replicate a known initial state. 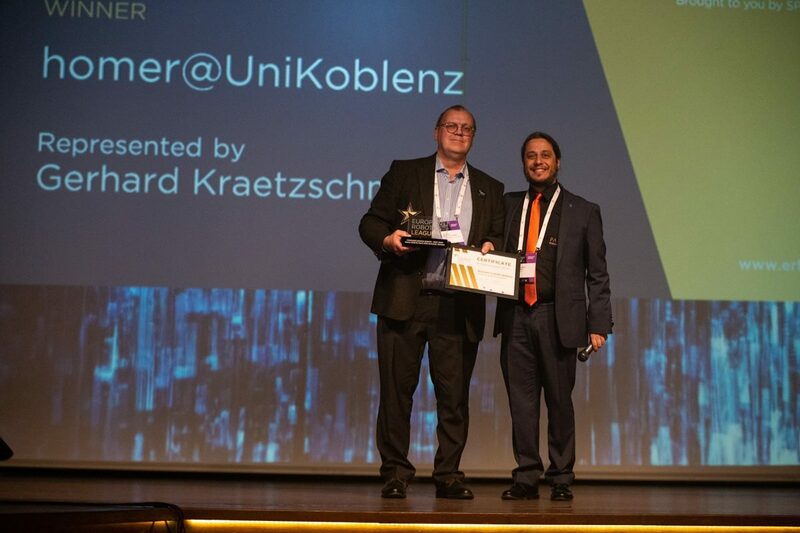 Gerhard Kraetzschmar of the University of Applied Sciences in Bonn represented us during the Award Giving Ceremony in Bucharest (Romania). We are now concentrating in the RoboCup@Home preparation for the German Open in Magdeburg. 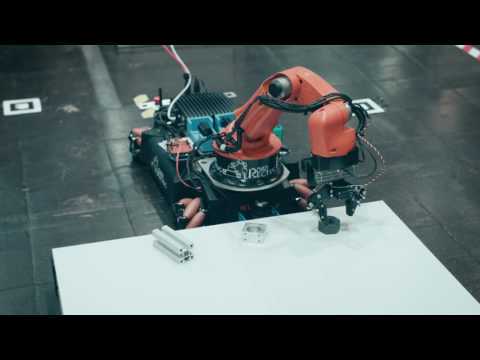 Together with the University of Applied Sciences Bonn-Rhein-Sieg we held a local tournament of the European Robotics League (ERL) in the Professional Service Robots category. This league is an innovative concept for robot competitions which stems from its predecessor, the RoCKIn@Work competition, and focuses on tasks that industrial robots execute in a real factory environment. The ERL is composed of multiple “Local tournaments”, held in different research labs across Europe, with certified test beds, and a few competitions as part of “Major tournaments” such as German Open. Teams participate in a minimum of two tournaments (Local and/or Major) per year and get scores based on their performances. Scores of the best two participation in tournaments for each team are added and teams are ranked based on their cumulative score. Prizes for the top teams are awarded during the this year’s European Robotics Forum. All participants and our robots together. The robots were benchmarked in two categories which require active perception in a convenience store scenario. In the gripping benchmark the robots had to grasp items from a table. In the Serving Goodies scenario objects had to be grasped from a box and stored on a table. The box picking problem is an especially complex as the objects separation by the robot’s grippers. TIAGo picking up the chocolate bars. In the end, we won slightly ahead of the team b-it bots@Work from Bonn. The intelligent controller of TIAGo — which verified successful grasping approaches — lead to an advantage over the b-it bots team. Further tournaments of the European Robots League are now planned annually after this first successful event in Koblenz. For more cool pictures, don’t forget to follow us on instagram! Winners of FBM2, TBM1 and TBM3. The European Robotics League local tournament for Consumer Service robots in Lisbon is finished now. Scratchy did quite a good job and we won the functionallity benchmark for navigation and also two of the four task benchmarks—Getting to Know My Home (TBM1) and Catering for Granny Annie’s Comfort (TBM3). In Visiting my Home (TBM4) and Welcoming Visitors (TBM2), the SocRob team was slightly better. Team Homer together with our friends from team SocRob and our robots. 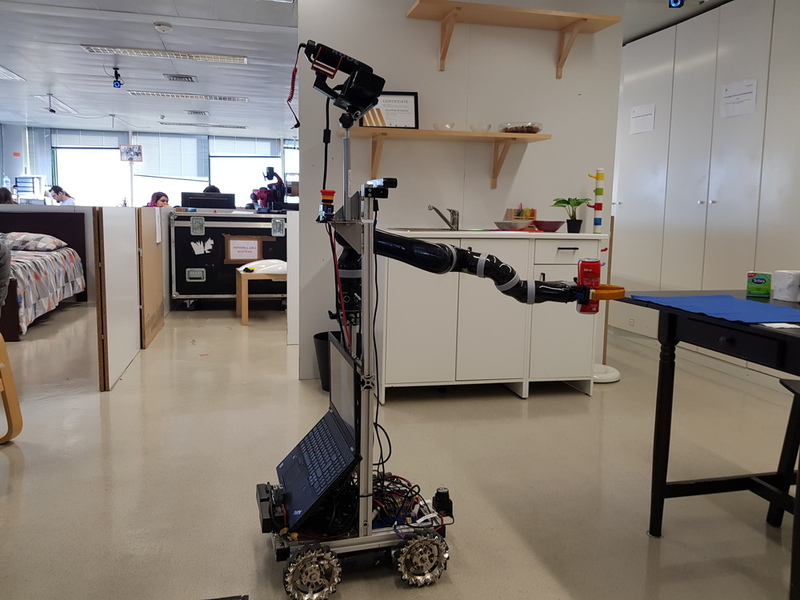 We really enjoyed our participation at the ERL in Lisbon and learned to build a robot from scratch, made new friends in Lisbon and additionally, we wrote a paper about Scratchy during the week. It describes Scratchy’s hardware and software setup to enable other teams to maybe participate on a low budget level in these kind of competitions. Sadly, Scratchy did not manage to grasp objects during the actual runs but at least during testing, he managed to pick up the coke and the toilet paper once. We are working on that issue right now. There are also some ideas for exchanging knowledge between the teams. For example, the advanced data augmentation of the SocRob team might be very helpful. In return, we would like to share our gesture recognition method with them. Scratchy and mBot are pretty good friends now. In two weeks, there will be one more ERL Consumer Service Robot tournament in Bristol, which we will most probably not attend. One reason is, that we ourselves plan on hosting a European Robotics tournament for Professional Service Robots around that time. For the final results of this year’s league, there will be an award ceremony in Bucharest in March. Stay tuned! It works well over here in Lisbon. Yesterday, we focused on the “Welcoming Visitors” and “Getting to know my Home” tasks — today it’s time for “Catering for Granny Annie’s Comfort” and “Visit my home”. Scratchy is doing well so far. The current scores of TBM1 - Getting to know my home and TBM2 - Welcoming Visitors. TBM1 is about autonomously learning where the things in the apartment are located — Scratchy does this by creating a semantic map. But because of facing some issues with the trained object recognition model, TBM1 didn’t earn that much scoring yet. Also in TBM2 we encountered a few initial mistakes but than there was steady progress. For each benchmark task, it is allowed to do seven runs and the final scoring is the median of the three best ones — so there’s still room for improvement today. Scratchy is able to grip objects - at least occasionally. And here he hands over a parcel during the Welcoming Visitors task. Our friends from SocRob are also doing a great job with their mBot. For more cool pictures, follow us on instagram! Thanks a lot! We highly appreciate your support! © 2019 Homer. Powered by Jekyll using the Neo-HPSTR Theme.